More often than not, it’s the LITTLE THINGS I do that make a difference in my life and marriage. 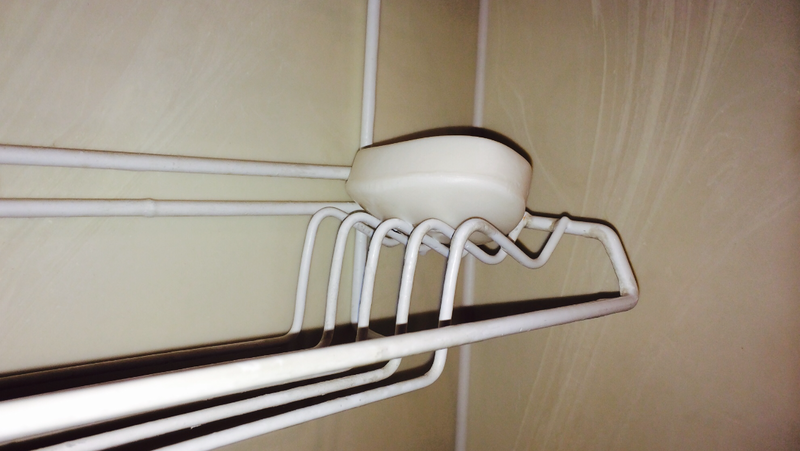 For YEARS, I constantly had to pick up the soap when I was taking a shower. Most of the time, it was not because I dropped it, but because it slipped off the rack. No matter how carefully I placed the bar on the rack, it slid off. My wife got used to the sound of the bar hitting the basin, followed shortly thereafter by my grimace and groan as I bent over to pick it up. The older I got, the more I groaned. Then, one day I took a GOOD look at why this was happening. I saw the rack in a new way. I discovered one minor adjustment was all that was needed. The rack is designed with 5 bars… I pushed the front one up 1/8 of an inch. TaDa!!! IT STAYED!!! Ever since that day, the only time I have to pick up the soap is when it slips out of my hand. My entire life is SO MUCH BETTER!!!! My frustration level is almost zero!! Well, in the shower, at least!! If I take that lesson and apply it to the rest of my life, I find the same truth… It’s usually (more often than not) the minor adjustments that make the biggest lasting difference. Sometimes, we need to see the situation through different eyes. (not recommended when showering) Sharing the hurts, habits and hang-ups of our past or present difficulties can lead to new insight from others. Discussing future plans with wise connections (U DO have some of those people U can call, right?) can help U make better decisions. Just taking time to get past the familiar frustrations can lead to a time of new perspective. Sometimes, all that’s needed is a 1/8″ push in the right direction to bring an end to life-long frustrations! Go ahead – take a new look! I dare you!! What is your daily frustration? Yeah, that one, the one that just came to your mind!! You didn’t get to where you are in one giant leap. Take a Baby Step. Today! Then, take the rest of the day off. When Tomorrow becomes Today, do it again. This entry was posted in GRACE, PEACE, PROCESS, RIGOROUS HONESTY, SERENITY, Simple on September 10, 2014 by jimdcat. Have U seen the movie yet? What if God is dead? What if God (and Heaven) isn’t real? • …U’re already as Forgiven (by God) as U’re ever going to be? • …God already Loves U as much right now as He ever will? • …The only thing God really needs from U is for U to spend time – with His Son? • …God wants U to work WITH Him instead of FOR Him? • …God doesn’t remember WHAT He forgave U of – He just remembers WHY? • …God can use Ur past to touch others at the place of their deepest pain? • …God wants U to stop trying to get Him to like U? This entry was posted in COME AS YOU ARE, DWELL, IT IS FINISHED, PAID IN FULL, Simple, Unconditional on May 4, 2014 by jimdcat. “Just a morning reminder for U – God Loves U.
I’m not sure if he was serious or not. In the past, I might would have been tempted to agree with him. After all, I was always trying so hard – to get God to love me more. He Loves me because HE CHOOSES to. There is nothing I can do to get God to love me. More than He already does and always will. Or less!! than he already does and always will. Just because HE CHOOSES to! Because – It is Finished! I am learning to – He’s teaching me to – Love Him back. Itreallyisjustthatsimple! …simple, yes, but it ain’t always easy! I keep getting in the way. This entry was posted in COME AS YOU ARE, DWELL, PAID IN FULL, PROCESS, Simple, Trust, Unconditional, Understanding on October 3, 2013 by jimdcat. “God isn’t going to let you see tomorrow before it’s time…. My life-long quest to understand more of God had become a futile search that never led to me trusting Him. Then I discovered – I did not have to understand everything in order to trust His Love for me. As I came to trust His Love for me, I was able to surrender my quest for understanding into His Care. For me! He now brings me understanding as He knows I need it. I can trust Him to do that. He Loves me. He wants me to love Him back. He does all the rest!! This entry was posted in Simple, Trust, Understanding and tagged Simple, Trust, Understanding on August 13, 2013 by jimdcat.